1. Reminders left behind. I’m fairly certain that the girls set aside a certain amount of time each day to leave small hints of their existence in various places. This way, we can never forget who else lives here during those last few hours each night after they have reluctantly gone to bed. Such things as sharp and pointy magic wands left in my bed, pink princess sunglasses left in front of the toaster, a Rapunzel doll carefully placed head first into the decorative bowl on the kitchen counter, a pile of tiny, colorful bracelets on the bathroom counter, various books, dolls, doll clothes, dress-up clothes and blankies discreetly shoved into the crevices of the couch, and tiny shoes and socks strewn about in every corner. These items are clearly placed very purposefully around so that we will never go more than five minutes without tripping over something, sitting on something, or just staring at something wondering how in the world it got to where is. No, my children, no. We have not forgotten about you yet. 2. The nighttime wake up calls. Little Boo wants to ensure that I am never away from her for more than three hours at a time. She typically wakes up at least once before I even go to bed. She clearly hates it when I sit down to try to catch up on my housewives whatever is on the DVR. It is inevitable that as soon as my head hits the pillow, she will be calling for me. And as if that is not enough, she usually wakes up once more for good measure, right around the time that I would need to be getting up if I wanted to fit in a workout before showering and getting ready for work. She has really perfected this tactic because not only am I with her throughout the night, but I am constantly reminded of her based on how tired I am all the time! Nothing says, “Hey, I’m a mom!” like accidentally pouring oj on your cereal in the morning or practically falling asleep on your commute. 3. “Mama!” is not just a name, it’s a job title. When the girls wake up in the morning, they don’t just sweetly sit in their beds waiting for Mommy to finish sleeping and come get them. Nope. As soon as they wake up, they shout, “Mama!” And they aren’t calling me by my name. No, this is more of an urgent reminder of my job title. In case I forgot that I am the Mama and it is my job to get them up and ready to take on the day. At first I thought that maybe I just had some messy kids that hate sleeping, but then I thought more about it and decided no. That’s not it. I have two perfect children that go to great lengths to ensure that I’ll never forget that they are quietly sleeping (in three hour stretches) down the hall. Besides, who could ever forget these two? Hahaha I love the whole “leaving reminders of their existence” part– I’m going to have to try and convince my Mom-friends of this. 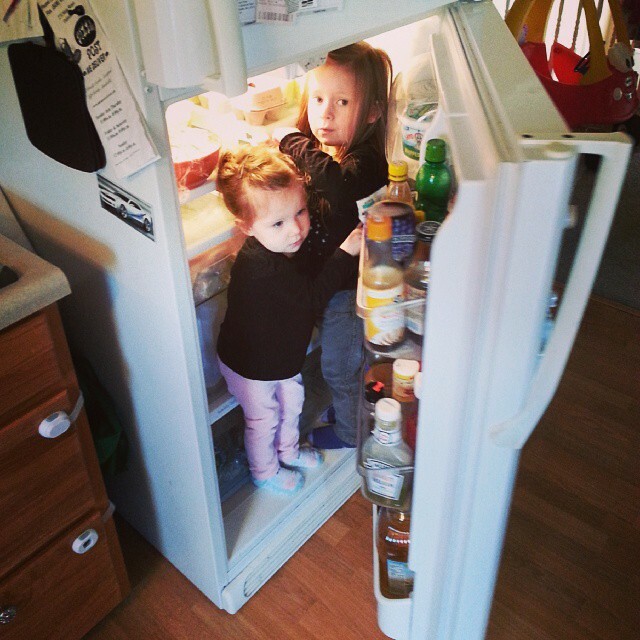 Also: the kids in the fridge pic is adorable/absurd. I’m wondering if there might be a story there as well. Yes, they are not messy, they just want us to be reminded of them! Well, the story there is that my kids do not like me to be on time for work. When I tell them that it’s time to go, they hide in various places or start to undress themselves. This was a pic of them hiding in the fridge to avoid daycare. Hahahaha that is adorable– hiding in the fridge, so dangerous yet so cute. And of course instead of telling them to stop and all, I’m grabbing my phone and taking pictures. Hmmmm, thinking about that, I can see how that would give them mixed messages.